Dr Blood's Video Vault: 2, 4, 6, 8... Who do we appreciate? 2, 4, 6, 8... Who do we appreciate? Unless you've been living under a rock for the last month, you must have heard about the latest multipack releases from Lionsgate and the whole kerfuffle about finding any of them in the $5 bargain bins at Wal-mart. It seems that some horror fans have been lucky enough to find the 8 pack (Waxwork / 976-Evil 2 / Ghoulies 3: Ghoulies Go To College / The Unholy / C.H.U.D. 2 / Chopping Mall / Slaughter High / Class of 1999) and 6 pack (Blood Diner / Parents / Earth Girls Are Easy / Sundown / Fido / Boy Eats Girl), and a few have also found the less interesting "Living Dead" 6 pack (Bride of Re-Animator / Beyond Re-Animator / Return of the Living Dead 3 / Return of the Living Dead: Necropolis / Return of the Living Dead: Rave to the Grave / Night of the Living Dead 3D). Of course, there have been so many cases of resellers buying every copy they could find to put on eBay and Amazon (at five or six times the original price!) that the multipacks are now rarer than hen's teeth in the wild. The picture above isn't of my own copies of these elusive DVDs, it's just one that I found by searching through Google Images. I haven't been to Wal-mart for almost a month now and have virtually no interest in the contents of these multipacks at all. Although I find it interesting that Lionsgate have finally started to release a few titles from the enormous catalogue of older movies which they have been sitting on, I wish they had done it better. You see, none of these movies are particularly good ones anyway. They range from average to absolutely awful and there are far too many comedies in the packs to make me want to purchase them. 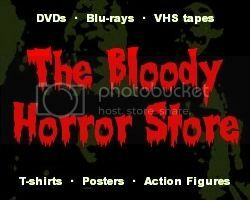 I already have "Boy Eats Girl" on a previous Lionsgate 4 pack from Wal-mart (along with "Drive Thru", "Creep" and "Tamara"), don't want the inferior Re-Animator or Living Dead sequels (especially as the only good one, "Return of the Living Dead 3", is cut except on VHS), and I really couldn't care less about any of the other films on those packs. Another oddity is how the films have been compressed onto the DVDs. They aren't double-sided flippers as you would expect but, in the case of the 8 pack, are two single-sided DVDs with 4 films on one side. This isn't as bad as it sounds even though there is bound to be a slight loss in quality, but it's a very unusual way of doing things. It goes without saying that these are all "bare bones" DVDs with no special features either. I'm not into DVD piracy but, as an experiment, I actually ripped the films from a few of my own DVDs and burned four of them to a DVD+R (not even a DVD-R which is slightly bigger) and the result wasn't all that different to the original give or take a few (barely noticeable) blocky artifacts occasionally. So I got to thinking that this is what the DVD manufacturers should have been doing all along rather than cramming the discs with a load of superfluous crap which nobody ever watches anyway. I don't need three commentaries, subtitles in a dozen languages, the theatrical trailer and yet another boring five minute "Making of" featurette to be able to enjoy the film itself. With Echo Bridge releasing similar quality multipacks (and, of course, Mill Creek being the masters of this practice already), wouldn't it be nice to see all of our favourite horror movies released this way from now on? Not only would it be a lot cheaper to have enormous DVD collections but the space saving alone would be worth it. If you've ever tried to move thousands of DVDs from one house (or one country) to another, you'll know exactly what I mean. The biggest advantage of multi-feature DVDs, however, is their ease of use. Although there have been attempts by Sony to create "DVD jukeboxes", most people have normal DVD players and having to get up to change the DVD from the box under the TV has always been annoying. Being able to watch more than one film on a single DVD has always been the ideal choice for most viewers since we're all pretty lazy and it's surprising that it's taken until now for the companies to realise that and to finally start using the storage medium properly. Possibly, it's the way that people have happily switched to the lower-quality streaming services such as Netflix and Hulu which has given everybody a well-deserved kick up the backside. If only the DVD manufacturers would stop ramming the alleged "superior image quality" of Blu-ray down our throats at every opportunity and start creating Blu-rays of all the franchises on one disc then they might start selling a few more of them again. In the current economy, most people aren't stupid enough to waste $20 or $30 on one movie but they might still pay that for the entire "Nightmare on Elm Street", "Friday the 13th" or "Halloween" series. Even if the movie industry is too greedy to ever go that route, we can be sure that the current trend in low-priced multipacks will continue for quite some time. Happy hunting in Wal-mart's bargain bins!